Claudia Kishi was one of the characters in the popular “Baby-Sitters Club” series for young adults. A Kickstarter campaign has been launched for “The Claudia Kishi Club,” a love letter to an iconic character. This documentary explores the legacy of Claudia Kishi from the hit “Baby-Sitters Club” books — and one of the only Asian Americans in ’80s and ’90s popular culture. Claudia inspired a generation of young readers of color, many of whom are now successful writers and artists creating stories of their own. Claudia is an eighth-grader who loves art, elaborate DIY outfits, and her grandmother Mimi. She’s a terrible speller, but an avid reader of mystery books. She hides junk food around her room because her parents don’t approve. She’s also Japanese American. For many Asian American women — and other women of color — Claudia was the first time they saw themselves represented in popular culture. A main character in Ann M. Martin’s best-selling series, she was one of the only Asian Americans in popular media when the books debuted in 1986. Not only was Claudia a rare Asian American protagonist, but she also defied stereotypical portrayals of Asian and non-white characters: She was creative, fashionable, popular, and (gasp!) bad at school. For young readers of color who craved seeing themselves in the media they consumed — not as distant historical figures, exotic outsiders, or diversity lessons, but as fully realized human beings — Claudia was a revelation. As a blossoming artist, Claudia was an especially meaningful role model for creatively inclined readers. The documentary will feature interviews with fans, including YA (young adult) authors C.B. Lee and Sarah Kuhn; comic artist Yumi Sakugawa; Angry Asian Man founder Phil Yu; and Naia Cucukov, the producer who is currently adapting the books for a new live-action TV series. Director Sue Ding is a documentary filmmaker based in Los Angeles. She directs and produces nonfiction media — from feature documentaries to virtual reality — for a wide range of outlets and clients, including The New York Times, PBS, and MIT Media Lab. Her documentary work explores the intersection of identity, social justice, and storytelling. Ding also writes about documentary and new media storytelling, and consults on multiplatform and immersive projects. She is currently spearheading a new emerging media program for the Los Angeles Asian Pacific Film Festival. Funds are being raised for an additional shoot in New York, where Ding hopes to sit down for an in-depth interview with Martin herself. A total of 356 backers have pledged $17,441 to help bring “The Claudia Kishi Club” to life. Although this exceeds the goal of $15,000, late pledges are being accepted. 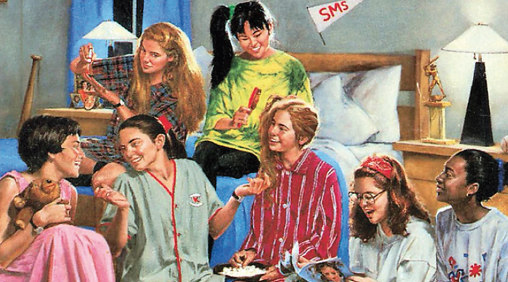 Benefits include signed copies of Sakugawa’s out-of-print Claudia Kishi zine and tickets to a private “Baby-Sitters Club”-themed screening party before the film is released to the public.